BREAKING: British PM May: "The government has concluded that it is highly likely that Russia was responsible" for nerve agent attack on Russian ex-spy. 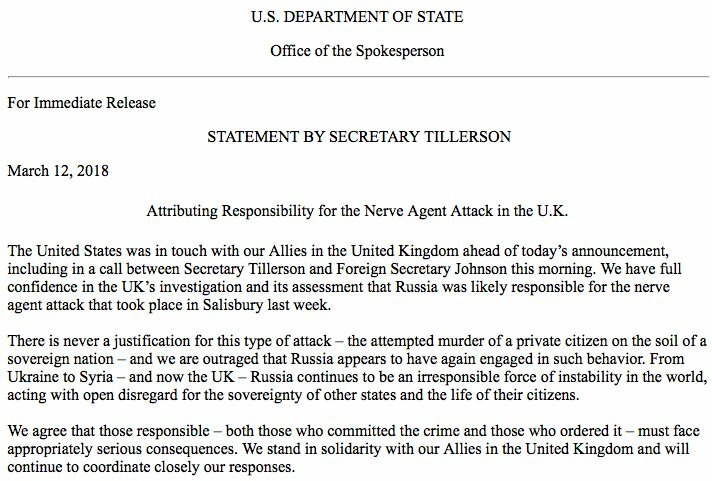 May: "Should there be no credible response, we will conclude that this action amounts to an unlawful use of force by the Russian state against the United Kingdom." British police launched a murder investigation Friday after an autopsy revealed that a Russian exile who was critical of Vladimir Putin was strangled in his home. It looks like the Sino-Soviet Bloc is back in again like Flynn. I don't even know why Putin has elections when they're so clearly fraudulent. He should just crown himself Tsar and get everything over with. If his elections were fair Zyuganov would have been President quite a few times. Addressing members of the Russian parliament, Vladimir Putin said last week: “The missile's test launch and ground trials make it possible to create a brand new weapon, a strategic nuclear missile powered by a nuclear engine. The range is unlimited. It can manoeuvre for an unlimited period of time. Yes, we should listen to these words, but we should listen to them as to the words of a madman joining the duet of two other madmen. Remember how, a little while ago, Kim Jong-un and Donald Trump competed about buttons to trigger nuclear missiles that they have at their disposal, with Trump claiming his button is bigger than Kim’s? Now we got Putin joining this obscene competition – which is, we should never forget it, a competition about who can destroy us all more quickly and efficiently – with the claim that his is the biggest in turn. It is very questionable if these new weapons will function as advertised. But the US failed to sign the deal that restricted the development of so called anti-nuke defense devices and the US is far ahead of the rest of the world as it relates to these devices. The new Russian weapons can't be stopped by these anti-nuke defense devices; e.g. a cruise missile that travels over the South Pole to reach it's target or an underwater drone that can get to the coastline and then detonate a nuke. If the US is the only one with such anti-nuke defense devices this changes the traditional mutual-destruction 'pack' that, so far, as prevented the use of nukes by any country. The bottom line being that the arms race is back on full bore between Russia and the USA. 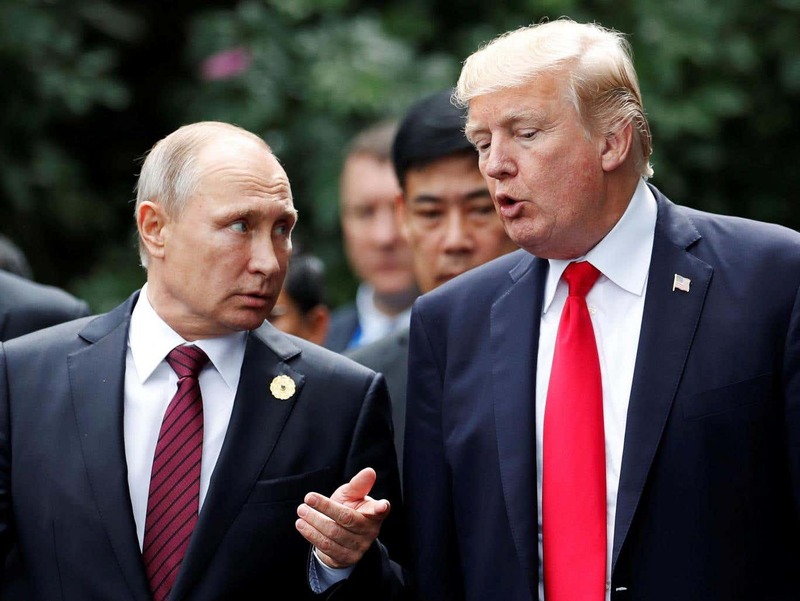 MOSCOW (AP) — Russians angered by the impending inauguration of Vladimir Putin to a new term as president protested Saturday in scores of cities across the country — and police responded by reportedly arresting more than 1,000 of them. In recent months, the Russian security agency, the FSB, has been abducting and torturing antifascists and anarchists. The FSB has then used forced confessions to fabricate a terrorist organisation called “The Network”. On Sunday 20 May 2018, 400 people attended a solidarity demonstration in St. Petersburg. Reports translated and abridged from rupression.com by Nick Evans. Placards with two of the antifascists arrested in Penza: Yulii Boyarshinov – Industrial Climber and Andrei Chernov – Programmer, Musician and Sportsman. Photo: rupression.comThere has been a lot of noise in the western media about the activities of the Russian security services abroad, but much less about the recent wave of repression directed at antifascists and anarchists living within Russia. came from a Russia-based military unit, according to an international team of investigators. "....the Netherlands and Australia have “asked Russia to enter into talks aimed at finding a solution that would do justice to the tremendous suffering and damage caused by the downing of MH17”. "The Kremlin believes it can act with impunity. The Russian government must now answer for its actions in relation to the downing of MH17,” Mr Johnson said. Russia described events in Kiev as an "anti-Russian provocation". Ukrainian police say they made one arrest. Babchenko's wife said on Tuesday she had found her husband at the entrance to their apartment block with bullet wounds in his back, and he was reported to have died in an ambulance on the way to hospital. That story was widely reported by media around the world, until Wednesday's sudden and extraordinary development. There were gasps and applause at the press conference in Kiev as Babchenko entered the room. He thanked the Ukrainian security services for saving his life and said he had had no choice but to take part in the sting. "I did my job," he said. " I'm still alive." "I have buried many friends and colleagues many times and I know the sickening feeling," he added. "I am sorry you had to experience it. But there was no other way." Hours after the news broke, Babchenko tweeted to say he would "die at 96" after "dancing on Putin's grave", referring to the President of Russia, Vladimir Putin. Babchenko fled Russia in 2017 after writing a Facebook post (in Russian) about a crashed Tu-154 transport plane, which went into the Black Sea while carrying a Red Army choir to Syria. He said this Facebook post, in which he described Russia as an "aggressor", had led to death threats and abuse from the Russian state. To assure Russian products are not cheap junk, must pass the Putin test. he takes it. Whatever floats your boat. #Russia's state TV: Participants discuss @BuzzFeed report that Trump told G7 leaders "Crimea is Russian, because everyone who lives there speaks Russian." They interpret it as Trump's recognition of Crimea's status. Sec. Mattis: "Putin seeks to shatter NATO. but to undercut and compromise our belief in our ideals"
To believe that neither Trump nor Banks colluded directly with Russia in 2016 is to believe in an awful lot of strange coincidences. The Russian authorities have used the World Cup as a useful distraction.